For the last two years, I have been licensed as an EMT-B, and for the past year I have been involved in teaching an EMT-B course through a campus organization called Illini EMS. At the BLS level of care, Standard Operating Protocols state that EMT-Bs are able to give only a handful of medications. Included among those drugs is aspirin, which is given to patients complaining of chest pain or discomfort suggestive of an acute myocardial infarction, better known as a heart attack. An estimated 1.2 million people in the United States experience myocardial infarctions each year (NHLBI). Even at the EMT-B level, aspirin is the first link in the chain of survival, so what is it about this drug that is so important and effective in treating patients that could be experiencing myocardial infarctions? How exactly does it work to reduce the severity of heart attacks? 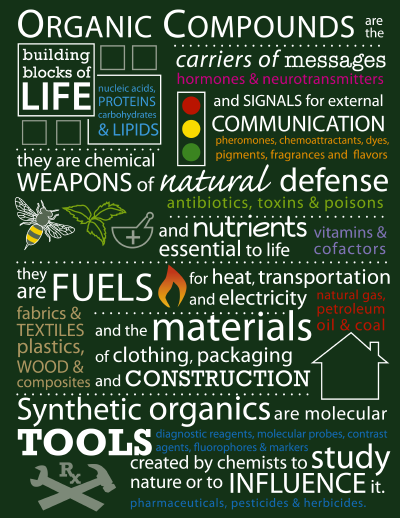 What is happening on a molecular and chemical level? An acute myocardial infarction occurs when the blood flow to a part of the heart is blocked and the tissue of the heart muscle starts to die because it is not being oxygenated. The buildup of a substance called plaque is a condition termed atherosclerosis. Over a long period of time, atherosclerosis can narrow a coronary artery so much that blood flow to the heart is almost completely obstructed. More often, what happens instead is that an area of the plaque eventually cracks or tears. Sticky, irregularly-shaped components of blood called platelets gather at the sight of wounds and form a lattice, or clot that blocks blood from escaping from the blood vessels. Now, if you were to have been thrown through the windshield of your car, blood clot formation to keep your blood inside your body is quite handy. However, these platelets also treat the tear in the plaque within the coronary artery as a wound, and can further obstruct an already blocked artery. Hence, the double-edged sword: the platelets that would normally be helpful can actually induce an acute myocardial infarction. At the EMT-B level, we are able to administer 324 mg of aspirin in order to prevent blood clot formation so that the blocked coronary artery may remain partially open, allow oxygenated blood to flow to the heart tissue, and decrease the impact of a myocardial infarction. More specifically, aspirin acts by inhibiting the ability of platelets to stick together, thus inhibiting their aggregation and clotting ability. On the level of cells and tissues, using aspirin with this aim makes perfect sense. But, how does work on a smaller scale? Aspirin, or acetylsalicylic acid, is small, 180.2 g/mol molecule of C9H8AO4 that is composed of a benzene ring with an ester group attached ortho to a carboxyl group. In addition to the anti-platelet, or anti-thrombotic, effects aspirin is known for its anti-pyretic, analgesic, and anti-inflammatory effects. But, it can also cause gastrointestinal side effects like stomach ulcers and bleeding. Such a diverse range of functions is indicative that aspirin impacts some central pathway. As it turns out, aspirin works by halting the production of prostaglandins. Prostaglandins are locally acting messenger molecules that are produced in various places throughout the body. In contrast to other hormones, prostaglandins do not act by entering the bloodstream and moving to their target cells; they act by affecting either the cell in which they are produced or target cells in close proximity to the site of production. That is to say that prostaglandins lack an endocrine and have an autocrine or paracrine type of cell signaling, respectively. Functions of prostaglandins include activating inflammatory response, which leads to pain and fever, and increasing the secretion of protective mucus in the gastrointestinal tract. A prostaglandin called prostaglandin G2 can be converted to prostaglandin H2. Prostaglandin H2 can produce prostaglandin E2, which is involved in pain, fever, and inflammation. While these effects need to be factored in when administering aspirin, EMT-Bs do not give aspirin for these purposes. However, prostaglandin H2 is also able to generate a molecule named thromboxane-A2, which has pro-thrombotic effects. How does clotting work? Thromboxane-A2 (TXA2) is expressed in activated platelets, platelets that actually form blood clots. When damaged, tissues have exposed collagen on their surface to which glycoprotein Ia/IIa receptors on the cell membrane of platelets are able to bind. Platelets are activated upon the binding of their glycoprotein Ia/IIa receptors to collagen. 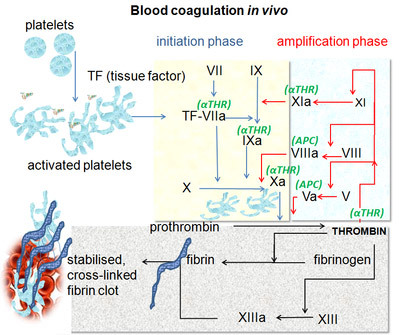 TXA2 and other pro-thrombotic factors are produced in these activated platelets; TXA2 causes a shape change within the platelet and activates nearby platelets when released into the surroundings of the original platelet. Once activated and TXA2 is produced, platelets undergo a morphological change from spherical to stellate. This irregular shape facilitates formation of a mesh, or clot, of platelets at the site of the injury. Molecules called fibrinogen can further bolster the clot by binding IIb/IIIa receptors, which are upregulated on the surface of activated platelets, and cross-linking adjacent platelets together. Therefore, by stopping production of prostaglandins, aspirin inhibits clotting because TXA2 cannot be produced to activate platelets. Next question- how exactly does aspirin put a stopper on prostaglandin production? Prostaglandins are made up of unsaturated fatty acids and are all derived from the precursor fatty acid arachidonic acid. Cyclooxygenase converts arachidonic acid into prostaglandins. Cyclooxygenase can actually further be categorized into cyclooxygenase-1 (COX-1) and cyclooxygenase-2 (COX-2). COX-1 is expressed constitutively in many different cells, while COX-2 is an inducible enzyme that gets expressed at sites of inflammation. Both perform essentially the same mechanism. Cyclooxygenase exists as a homodimer, meaning that there are two identical cyclooxygenase subunits that come together to form the full functional enzyme, and is anchored to the endoplasmic reticulum by hydrophobic amino acids. Cyclooxygenase has two different active sites- a cyclooxygenase active site and a peroxidase active site. The cyclooxygenase active site is buried within the protein and is reachable by a tunnel defined by four alpha helices, formed by hydrophobic-rich amino acid residues 106-123, 325-353,379-384, and 520-535. Arachidonic acid is shuttled into cycloxygenase until it reaches the active site. Cyclooxygenase then converts arachidonic acid into prostaglandin G2 by adding oxygen selectively in the R configuration to carbon 11 and in the S configuration to carbon 15. The peroxidase active site is located in close proximity to the cyclooxygenase active site, and is the sight at which prostaglandin G2 is converted to prostaglandin H2. Two electrons are added to the system and reduce the hydroperoxide bond of prostalglandin G2 to an alcohol, thus forming prostaglandin H2. More specifically, the activities of the cyclooxygenase and peroxidase active sites are coupled by the formation of a phenoxyl radical on the Tyr385 residue of the enzyme. When an oxoferryl porphyrin-cation radical oxidizes the Tyr385, a radical on Tyr385 is produced. The tyrosyl radical homolytically abstracts the 13proS hydrogen atom, which leads to the stereoselective formation of prostaglandin G2. The prostaglandin G2 then moves to the peroxidase site, where the hydroperoxide bond reacts with a hemin group to be reduced, which regenerates the oxoferryl porphyry-cation radical. Aspirin inhibits this entire process by binding irreversibly to the cyclooxygenase site. The acetyl group of aspirin is linked to serine residue 530 at the active site of the enzyme , which prevents arachidonic acid from getting into the active site. Since this linkage between aspirin and cyclooxygenase is covalent, cycloxygenase gets permanently inactivated. Overall, aspirin acts by inactivating COX-1 and COX-2, which are responsible for producing prostaglandins from arachidonic acid. Thus, aspirin promotes anti-pyretic, anti-inflammatory, and anti-thrombotic effects. Since this inactivation is irreversible, once the enzyme is inactivated no prostaglandins can be produced through that enzyme for the lifetime of the platelet. New platelets must be synthesized in order to be activated and form clots. So when aspirin is administered to patients experiencing a heart attack, their platelets are inactivated so that blood clots do not form in the blocked coronary artery. Aspirin’s effects are rapid, can last up to a few days, and are well proven to save lives. Very well written and interesting post. I was particularly intrigued by this post because I had a family friend's father pass away from a heart attack and he ended up passing away in the car on the way to the hospital. I think your post covered the important factors necessary to prove aspirin is effective and could potentially save someone from death via heart attack. Good work. Great post! It was very interesting learning about the exact effects of aspirin. In particular, I thought it was interesting as to how exactly the aspirin irreversibly inhibits cycloxygenase. As a fellow EMT-B, its nice to know how the process works as opposed to "uh oh chest pain lets give em aspirin". It also makes sense now to learn that the process is irreversible, explaining why the side effects of aspirin lasts a few days. Side note, I like how you added color to the complicated paragraph at the end. Helped to mentally keep everything in order. Good job! I first learned that Asprin was administered to someone who may be experiencing a heart attack on a flight home from Europe. While we were over the middle of the Atlantic Ocean the flight attendant went over the planes intercom and asked if there were any doctors on the plane and for them to come to go speak with the nearest flight attendant. At the time I had been traveling with my dad who is a physician. He got up and talked with the flight attendant. As it turned out a passenger in another part of the cabin was experiencing heart attack like pains. My dad, as well as other physicians who happened to be the flight went to the side of the other passenger to diagnose the situation. As it would turn out the passenger was just having really bad heart burn and due to a language barrier the fight attendant was confused. When my dad returned to his seat next to me I asked what happened and he said it was just a false alarm and they though the person was having a heart attack. I asked him what he and the other doctors would have done if the patient was undergoing a heart attack? I came to learn that most planes have the drugs necessary to treat heart attacks including, Beta blocker, diuretics, EKG and AEDs. But he also told me that aspirin was a common drug administered to help people with heart attacks. It was really interesting to read exactly how aspirin works to decrease pro-thrombotic events and prevent a heart attack. Great post!